The benefits of the internet in the exchange of views between like minded individuals and their particular interests, and as a source of worldwide plans and layout ideas for all sorts of layouts. US city based micro 39in x 8in layout in On30, and designed with beginners in mind. Detailing Proto 2000 Alco S1 in the earlier 'Pumpkin' colour scheme. Author builds a 50 year Ratio signal box kit bought for 10p at a swap meet. The charms, whys and wherefores of narrow gauge modelling with references and its possibilities. 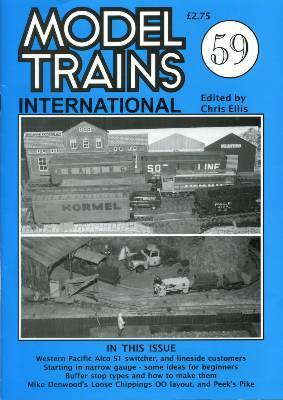 Overview of buffer stop types and models available in the UK, Europe, USA and narrow gauge. KD's are good for some, but Magitrix offers new opportunities with smaller hidden magnets with automatic un/coupling. Making some of your freight cars look a little different; leased, owned and hand-me-down American freight cars 'patched' for new owners. Actual examples of small American lineside industries from New England. The addiction of small space layouts; a nicely modelled OO BR branchline ex LMS/LSWR terminus just 6ft long with sector plate, set in Wessex. Authentic American lineside warehouse modelled in low relief for HO. Observing the railway scene and using/adapting commonly found model kits, as shown and in 57/57. Timesaver and Inglenook plans combined to make a HO American switching layout 7ft long.